Skirt or flank steak is eaten a lot in America, and in France, but hardly at all here in the UK. This is madness, as it is so much cheaper than any other sort of steak and so rich in flavour. I think what has put people off in the past is that, in Britain, it has been cooked in low and slow braises, which turns it into shoe leather. Bavette is the external part of the skirt (onglet being the internal connecting tissue) and all you need to do to cook it is, as my butcher puts it, “sear the hell out of it and serve it rare”. I find 2 minutes a side on a very hot, ridged griddle optimum, but this does mean it’s only for those who like their steak blue. Put the tamarind paste, soy and hot water into the smallest saucepan you have, and stir over a low heat to dissolve the tamarind. When it’s as smooth as you think you can get it – the tamarind paste I use says it’s without stones, but I do find the odd one, and I don’t bother to get rid of them – remove to a bowl or jug, whisk in the oil and honey, and leave to cool. Do not use until it is cold. 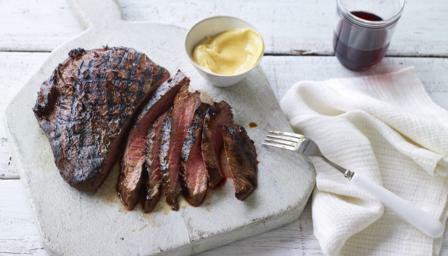 Put the bavette steak into a resealable freezer bag, pour in the cold marinade and squelch it about so that the thin steak is covered on both sides, then seal, lay on a plate and put in the fridge overnight or for 1 day. Bring it back to room temperature, prepare a large piece of kitchen foil, then heat a ridged griddle till very, very hot. Lift the steak out of its marinade, letting any excess (and there will be a lot) drip back into the bag and then slap the meat on the griddle and cook for 2 minutes a side. Immediately (I use tongs for all this) transfer the steak to the piece of foil and make a tightly sealed but baggy parcel, and let the meat rest, on a chopping board, or any surface that is not too cold, for 5 minutes. Then unwrap the foil, transfer the steak to a board, and carve in thin slices against the grain.